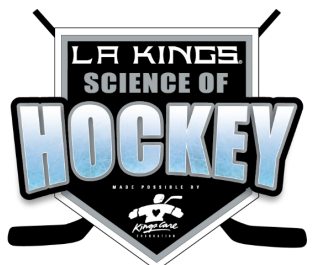 The LA Kings Science of Hockey exhibit is open at Discovery Cube Los Angeles (DCLA). Science and hockey fans alike can now be immersed in one of the most technically advanced sports-themed exhibits featuring the Stanley-Cup Champion Los Angeles Kings. This permanent attraction offers interactive learning focused on the science, math, and skills behind the thrilling sport of hockey. You Be the Goalie / You Be the Shooter – Participants in this experience don a blocker and glove to try and stop pucks shot from virtual versions of LA Kings players Dustin Brown, Drew Doughty and Jeff Carter, OR take shots on LA Kings goalie Jonathan Quick, which reflects speed and accuracy readings. Penalty Box – Fans can help get an LA Kings player out of the penalty box and back on the ice by correctly answering a series of questions about the math and science surrounding the sport. Zamboni Test Drive – Occupying the center of the Science of Hockey is a replica Zamboni offering guests the once-in-a-lifetime chance to climb aboard, turn the auger and get the feel of driving this ice-resurfacing machine. Suit Yourself – NHL hopefuls can use interactive touch screens to design their very own jerseys. Equipment Lab – An interactive display allows guests to technically compare an old uniform and equipment to the modern, streamlined uniforms of today. Meanwhile, a display wall of equipment cut in cross-section and a series of videos demonstrate the equipment in action, force and power exchange dynamics, STOP program and safety tips. Healthy Locker Room – Guests learn about training and nutrition by playing interactive games in this technically advanced replica of the LA Kings locker room. Skater Challenge – Intrepid skaters can follow Dustin Brown or LA Kings mascot Bailey around the ice to test their skating ability and speed. LA Kings Story – The culmination of the Science of Hockey experience is the LA Kings Story featuring great moments in LA Kings history, with storytelling supported by compelling, larger-than-life images, artifacts and video. A photo opportunity will allow fans to picture themselves holding the Stanley Cup. The Science of Hockey is included in general admission to DCLA. Tickets to DCLA can be bought online at www.discoverycube.org/la/ or on campus. General admission prices are as follows: adult ($16.95), senior ($12.95), and children 3-14 ($12.95). Now through June 30th, there is special admission pricing of just $10 for everyone.